TiVo and other DVR systems are becoming increasingly more popular in households, leading consumers to skip commercials. Also prospective customers have short attention spans relative to advertising done on radio, in newspapers, and in other periodicals. Advertising has increasingly become more of a challenge. On top of that, IT’S EXPENSIVE! Since 2000, many businesses have turned to vehicle wraps to create an effect that is both eye catching and memorable. Outdoor Advertising Magazine states that vehicle wraps have a 97% recall rate. Furthermore, Product Acceptance and Research states that 80% of people recall the specific advertisement seen on a vehicle wrap. Do you occasionally see the Oscar Meyer Wienermobile, driving around? For a moment you stop to admire the hot dog shaped vehicle in it’s uniqueness to any other vehicle on the road. Over the last 75 years, the Oscar Meyer Wienermobile has proven to be more memorable than TV commercials, newspaper advertisements, and even regular billboards. 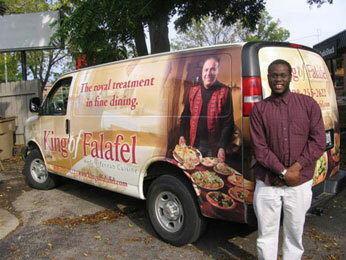 Investing in a vehicle wrap can have that same effect on your potential customers. My interest in vehicle wraps first came about in May of 2009, when I started working with a new sign company and they proposed the idea of doing vehicle wraps. This led to a sign expo in Indianapolis in late May 2009. I learned about how cost effective a wrap is compared to radio and TV ads. I have always noticed the uniqueness of a wrap while driving on the road and have had conversations with associates as to how important it is to keep up their advertising, especially now in the recession when companies have to work harder to retain customers. Here it was: a solution for a company to cut costs and have a greater advertising impact. I was blown away! Full vehicle wraps can average $2000 for a small car. A midsize car or minivan can average $2500-$3500 and it can go up to $7500 for a bigger truck. Compare this to the average cost of TV commercials and newspaper ads, which is well over $10,000. Also, remember, many households have DVRs and most people these days have short attention spans. With that being said, there is no question that a wrap gives you more bang for your buck. At a seminar in Indianapolis, a gentleman who owns a sign business in Texas said, “I had a client tell me that his customers see his vehicles all over town. The surprising thing in all of this is that we only wrapped two vehicles.” Wraps can create up to 8.4 million impressions in a city of 50,000. With this more cost effective way to advertise and increase sales, a business can’t lose. When choosing a company to design, print, and install your wrap, it is important to consider several things. 1. Make sure the design going on the vehicle is eye catching. Remember what I mentioned about creating something that is memorable. The point of wrapping should be to capture the attention of your potential customers. 2. Make sure you inquire into the company’s warranty on the wrap. This includes printing and installation. It is important to make sure that the ink that prints the wrap will not fade. Most inks will last up to five years. However making sure that the wrap is installed properly is even more important so that your own mobile billboard is going to look great for years to come. This blog changes in September. Thank you and good luck.